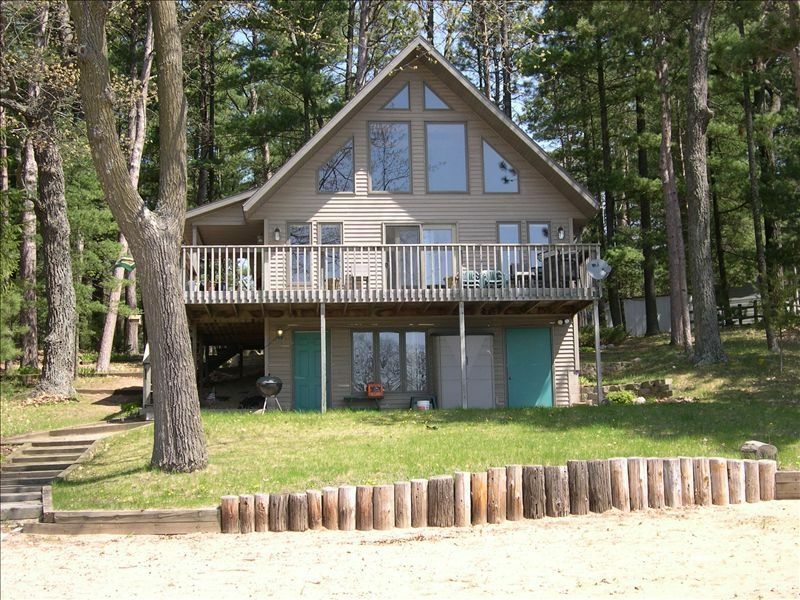 Charming lake cabin nestled among towering pine trees over looking beautiful Big Silver Lake gives you a wonderful setting to relax and enjoy the peace and serenity only Central Wisconsin can provide. Spend your days: fishing from the dock, swimming at the beach, building a sand castle, sun tanning, roasting marshmallows over the bonfire. Add additional fun to your stay by bringing your boat to enjoy fishing, water-skiing, jet skiing or just cruising the 350 acre lake. There are many scenic walking areas to hike, bike and see nature at its finest. Located just minutes from dining, shopping, and two championship golf courses. You can choose to boat or drive to the Silvercryst Supper Club where you can enjoy outstanding dining and entertainment. Located 3 1/2 hours North of Chicago, two hours North of Milwaukee or 90 minutes NE of Madison. Boat Rentals are available from a nearby marina which also has delivery of various rentals. For more details contact us. Camp fire pit..... Bring your own marshmallows. 2 Docks 1 is available for docking your motor/ski/fishing boat. Fantastic house and perfect for our family of 4 plus aunt and uncle. Everything Jon the owner described is accurate. Jon was even there to meet us, staying with a relative nearby. He was in no way intrusive and was there to help at just the right moments! We will definitely be back! Wish he built a second shower for the bathroom at downstairs. The only thing this house needs two full bathrooms. This house and lake has a little bit of everything. Extremely quiet lake that offers swimming, kayaking, fishing or boating excitement. Very clear lake, home located in a bay makes it great for kids to explore. Clean home, well kept. The little towns around the area were also fun to make our own adventures with the family. We had an awesome week at Silver Lake Escape. The cabin was clean and comfortable and we appreciated the welcome frozen pizzas and water. Having the two lake access points was tremendous, as the grown ups enjoyed the swimming raft while our little guy preferred the shallow beach area. Having the 3 levels was nice, as every group could have a bit of space. The lake was very clean and we enjoyed the canoe, kayak and paddleboat, as well as fishing off the pier. Would definitely recommend this place to others! Thanks John. The owner was great, answered all questions promptly. Place was clean and well stocked with a complete kitchen--everyone in our family said it was the best place we have ever stayed on the lake! What a fabulous place to have a vacation! The cottage was in the perfect location. My sons had such fun catch and release fishing right off the dock, we all enjoyed using the kayak and canoe to paddle over to the swim platform. Ample space for my husband and I, our two boys, and my parents.